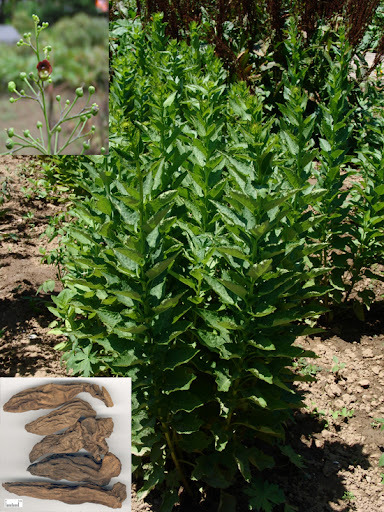 Common Name: Scrophularia root, Ningpo figwort root. Part Used & Method for Pharmaceutical Preparations: The roots are dug in the period at the Beginning of Winter (nineteenth solar term) and dried in the sun until they are black on the inside, then they are cut into slices. Properties & Taste: Bitter, sweet-salty and cold. Functions: 1. To clear heat and nourish yin; 2. To release toxins and nodules. 1. Sore throat caused by exogenous pathogenic wind. Scrophularia (Xuanshen) is used with Platycodon root (Jiegeng), Arctium fruit (Niubangzi) and Mentha (Bohe). 2. Sore throat caused by excessive interior heat. Scrophularia (Xuanshen) is used with Ophiopogon root (Maidong), Platycodon root (Jiegeng) and raw Licorice root (Gancao). 3. Scrofula, goiter and subcutaneous nodules. Scrophularia (Xuanshen) is used with Tendrilled fritillary bulb (Chuanbeimu) and Oyster shell (Muli). 4. Boils carbuncles and furuncles. Scrophularia (Xuanshen) is used with Honeysuckle flower (Jinyinhua) and raw Licorice root (Gancao). 5. Febrile disease in which pathogenic factors attack the nutritive and blood levels: a) thirst, fever, insomnia and deep red tongue proper with scanty coatingScrophularia (Xuanshen) is used with Fresh rehmannia root (Shengdihuang) and Ophiopogon root (Maidong); b) high fever, unconsciousness and maculopapuleScrophularia (Xuanshen) is used with Gypsum (Shigao), Anemarrhena rhizome (Zhimu) and Rhinoceros horn (Xijiao). 6. Constipation due to dryness in the intestines. Scrophularia (Xuanshen) is used with Fresh rehmannia root (Shengdihuang) and Ophiopogon root (Maidong). Dosage: 10-15 g, decocted in water for an oral dose, or used in pills and powder. 1. Contraindicated for use in patients with Cold syndromes of Deficiency type of the Spleen and Stomach. 2. It is incompatible with Radix et Rhizoma Veratri (Li Lu).